I’ve had quite a few friends and family visits now and I’m starting to realize that I have a few favourite places to take these tourists when they are here in Amsterdam. I thought I’d share these, in my blog, for anyone thinking of visiting soon. I’m not going to pretend to know any important dates, designers, architects or historical facts, but I can tell you what I know without ripping-off a rough guide. If you are in Amsterdam and you want these details you’ll just need to buy a proper guidebook. If you are arriving in the Netherlands for the first time, and you haven’t yet realized how much the Dutch rely on this cheap, environmentally-sound mode of transport, you’ll be shocked, amazed and astonished to see the multi-storey bike park located next door to Amsterdam’s central station. For many people, the Centraal Station is the starting point to their weekend in the city, so it’s a quick and easy little side-trip to go and marvel at this really very Dutch sight. Central station would itself be interesting if it wasn’t in a constant state of repair. I first came to Amsterdam nearly 5 years ago, and I’ve never been to the station at a time when at least one quarter of the station hasn’t been covered in scaffolding and plastic sheeting. This is the cinema where all the big premieres open in Amsterdam (I’m very excited to write that I saw Rowan Atkinson outside there when Mr Bean the movie opened last year). 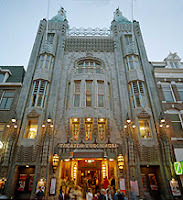 Anyway, the cinema is amazing, it’s a frighteningly extreme example of 1920s art-deco Amsterdam with twin, evil-looking, towers on the outside, and opulent red carpets and brightly painted ceilings inside. The best way to see the theater is of course to see a film, but if there isn’t anything on that you want to see, don’t be afraid to poke your head inside the foyer to see the ceiling which magically changes colour every 20 seconds. 8. The van Gogh museum I like this museum because it is not a gigantic maze of artists you’ve never heard of or art you’ve never seen before and will never see again. This is a small, single artist gallery, nicely designed, and packed with famous paintings I just wish I could take home with me. The van Gogh museum is in the middle of the Museumplein, a vast, flat grassy area, surrounded by museums (such as the Rijksmuseum), the classical music hall, and one of the only Albert Heijns open on Sundays! I guess this is the equivalent of Leicester Square in London, although the cinemas are not on the square but on a street that runs of the square (Reguliersbreestraat). The most interesting parts of Rembrandtplein are the 3D version of Rembrant’s “Nightwatch” which was created by a couple of Russian artists and placed here about 2 years ago, the large light screen (think Piccadilly Circus) and a couple of nice restaurants/bars: De Kroon (funked-up gentleman’s club) and Café Schiller, an art-deco bar next to the Hotel of the same name. 6. Flower Market The flower market is quiet small, but you will never see so many bulbs in your life again. It floats along the bank of the Singel (canal), and consists of about 20 flower stalls in a row. The prices are reasonable as compared to the UK, but obviously rather more expensive than the rest of Holland as this is catering for the tourist trade. I have bought an Amaryllis from here and it was beautiful. The market runs parallel with Amsterdam gayest street, Reguliers Dwarsstraat, which has one of my favourite restaurants on it: Rosie’s Cantina (a Mexican restaurant). Dam square isn’t really that exciting, but it’s the closest thing to Trafalgar Square in Amsterdam. To me it feels like the heart of Amsterdam, as it lies relatively centrally between Centraal station, the red light district, Joordan and Spui. The main attractions on the square are the Koninklijk Paleis (Royal Palace) where Queen Beatrix receives foreign dignitaries, the war memorial, and a tiny plaque dedicated to Saint Nicholaas (SintaKlaas) on the North side next between the Nieuwe Kerk (new church) and Nieuwendijk. Dam square plays host to concerts on New Years and other special days, but it more often than not is smothered with rather rubbish street performers (see "Invading Holland", Invader Stu’s blog, for more info on these guys). 4. The Red Light District Day or night, Amsterdam’s red light district is fascinating. The first time you see the ladies in the window’s you can’t quite believe it and everyone I’ve shown around this area of town has been totally intrigued, despite themselves. The most interesting parts of the Red Light District to me are: the areas around the Oude Kerk, which is the weirdest contradiction I’ve ever seen (prostitutes flaunting their wares right opposite a huge church), and the narrowest lanes which are wide enough to fit only one person, but still have windows on both sides. This museum shook me up; I felt really melancholy for a whole week afterwards, and still feel differently about the city where I now live. I read Anne’s diary at school and this house brings all that to life in a very simple, respectful way. Inside the house you learn about the Frank’s lives before the war, the business they ran and the friends they had. Then you are taken behind the bookcase into the secret Annexe and you see the tiny rooms and space they occupied for two years during WWII, before they were found. The area where I live in Amsterdam is the neighbourhood where Anne lived before she went into hiding. Her school is in the street parallel to mine, and she bought the books in which she wrote her diaries from the book shop on the corner, which I can see from my living room window. After the tour of the Annexe it took me days to stop picturing my street as it would have been during the war, with Nazi soldiers and tanks roaming where the cyclists, trams and cars roam freely today. This is an amazing, secret, world hidden right in the shopping centre of Amsterdam. Behind Spui there are beautiful old house around a very well kept “village green” that are lived in by single women. The square was once a sanctuary for Catholic nuns, and it still has a very calm atmosphere, cut off from the hustle and bustle of city life. There are two churches within the square, one is a catholic chapel, the other an English Church. The square also protects Amsterdam oldest surviving wooden house. Tours are not allowed into the Begijnhof, and it feels like a privilege to be allowed to enter there at all, so if you do go, please treat the area and its occupants with respect and minimize the photos and noise you make. To round it all off, or better, as a starting point for a trip to Amsterdam you must take a Amsterdam canal boat tour. One of the best boat tours leaves from the Rokin (take Tram 4 to Spui or Tram 12 to Muntplein) and is called Rondvaart. This tour takes you all around Amsterdam, the Keizergracht, Prisengracht and Herengracht, you see the 7 bridges, the blue bridge, the Ijselmeer, and lots more. It lasts about one hour and I've taken this tour about 5 times now. It’s best not to take a tour when it’s raining as the boat windows steam up, but if you don’t have any option and you’re in Amsterdam when it’s raining, bring lots of tissues with you to wipe the windows! After the tour follow the small street behind the Rondvaart hut passed the Diamond shops and on the right there’s a really cute little pancake house, which you need to reach buy a near vertical staircase. There’s enough seating room for about 12 people inside and each pancake is made individually by a very interesting (very Dutch) old couple. The restaurant is called “Upstairs”. Dutch celebrities - who are they? It was my husband and my 1st wedding anniversary on Monday and I was devastated that I couldn’t buy him a “happy anniversary” card. In Holland you can only buy cards to send to the couple. To take this a few years into the future too, it seems that the Dutch don’t hold any significance for 5, 10, 20, 30 and 40 year anniversaries but choose to celebrate the all too metric 12.5 years (! ), 25 year and 50 year anniversaries only!! I hadn’t noticed this before Monday when we were driving to the airport to return a hire-car in the torrential rain and thunder-storm and we could not see any of the road markings. It was then I realised that Dutch roads are all the more smoother because they don’t have cat eyes here. Someone needs to add cat-eyes to the parts-list of model building company in charge of Dutch roads. This is a really clever device the Dutch use everyday to ensure they get perfectly sliced thin layers of cheese for their lunch-time or breakfast bread rolls or sandwiches. It’s typically Dutch of course because it means that you take only the exact right amount of cheese, there is no room for greedily taking a slightly thicker slice of cheese, the only way to get more is to slice off a whole extra piece, but that is too obvious to people around you. My only concern about Cheese Schaves (?) is that when you get to the end of a piece of cheese, and you’re working with just a centimetre or two of cheese before the rind, the cheese schaaf does become a bit dangerous. Many a time have I almost cheese schaafed my wrist open while trying to get that last remaining bit of cheese off the rind. This tool is in fact the ultimate suicide device. There is no English translation for the word vla, it simply doesn’t exist in England and I have not seen it in any other country than Holland, although I expect the Belgians probably have it too. The only parallel I can draw with English stuff is to compare Vla to a slightly runny low-fat Ambrosia Devonshire custard (don’t tell my husband I said this, but it does actually taste exactly the same and I’ve just found a recipe for making it which uses custard powder as the base – he’ll be devastated http://www.typicaldutchstuff.com/vla.shtml ). So vla has a “vague resemblance” to custard, but you can get away with eating a whole bowl of vla, by itself, for pudding and no-body will blink an eye-lid. Magic. This is another thing that I had never seen or heard of before I came to Holland (in fact everything in this list falls into that category). White asparagus is a delicacy in the Netherlands and Belgium, and when they are in season you can’t escape them in supermarkets and restaurants. They look similar to their green relatives but they are longer, much fatter and totally anaemic looking. They are white because they are deprived of sunlight when they are growing up, and from what I can tell are basically nurtured in the same way as mushrooms. I have cooked them a couple of times and the hassle factor, compared to green asparagus, is considerable. First of all you have to peel them (I’ve actually used my cheese schaaf to do this), then you have to steam them on a bed made of their own peeled-off skins for about 15 minutes. All the recipes I’ve ever seen for these ghostly vegetables are based on, or totally limited to, butter and cheese. I still prefer the green ones. This is less of a “thing” than a massive cultural difference between NL and, let’s face it, the rest of the world. In the UK you are given milk at lunch time as a child at primary school. You wouldn’t be seen dead drinking it at lunch time at secondary school. And, as an adult, milk simply isn’t available to you at a work canteen or in a restaurant. But in Holland, you are a weirdo if you don’t drink milk at lunch time, no matter what your age. My husband and his family always have a glass or mug of milk with their lunch time bread and cheese. Even more amazing to me, however, was my first few experiences of lunch in an office canteen. The canteen sold 300ml plastic cups of milk (with foil caps) and these were the hottest selling items going. Every single (Dutch) person in the canteen bought a plastic cup of milk and it was so strange to me to see fully-grown men, often senior managers in smart suits, drinking milk in a way I had not seen since I was 11 years old. Every day I would buy a can of diet coke and for the first three weeks or so I was ridiculed for being “so American” and totally unhealthy, or asked “Don’t you drink milk? Don’t you like it?” To answer that question again: yes I do drink milk, but through eating my breakfast cereals every morning. It seems Dutch people don’t eat breakfast cereals, they normally eat bread so the first milk they get in a day is at lunch. For all the English-speakers reading this blog, the next few lines are basically referring to the chocolate sprinkles, or hundreds-and-thousands, that are, in most countries, the reserve of cakes, pastries or donuts. Who in their right mind would also sprinkle hundreds-and-thousands onto buttered bread? Extraordinarily, there’s a whole food industry built up around these polished up little mouse poops. Unilever makes them, there’s a premium brand “De Ruijter” and all the supermarkets sell their own brands too. Unlike buying breakfast cereals, you can buy family-sized boxes of hagelslag, which last my two-person household at least six months. And you can even buy mini-boxes of De Ruijter hagelslag, which are just the right size to sprinkle on one slice of bread. These mini-versions are available in multi-packs in supermarkets and sold separately in work canteens and hotels. This is, again, less of a thing, than an observation and something I wondering whether any other expat in Holland has noticed too. All the motorways and major roads here look like they are no older than 10 years old. All the road surfaces are immaculate, all the paintwork is perfectly neat and still bright white. All the road signs are hung above the motorways in exactly the same way, throughout the entire country (the metal construction on which they are placed is identical where-ever you go). The road signs within cities, and those for bicyclists, are also placed on posts that are exactly the same where-ever you are in Holland. The signs for cars are hung on blue and white painted posts (immaculate as if they were painted yesterday) and for cyclist these post are red and white. It is as if one single company has spent the last decade building all the roads, using an unlimited supply of exactly the same parts. The roads are built as if they were made by some model-building enthusiast playing with an entire country. If you are an expat like me, look out for this and marvel at how it’s possible and the huge amount of money it must have taken. If you’re Dutch, open your eyes to this rather unique phenomenon and let me know if you think there is any other evidence that you have been living in a model country all your life (it reminds me of that film “the Truman show”). The only problem I can see it that in the next 10 years or so every major road in Holland is going need replacing. What a job. I’m not sure I want to be here then. Okay, now this blog post may seem to be a reaction to yesterday’s big worldwide concerts “live earth” and I guess in a way it is, but I want to set it clear that I am genuinely concerned about the issue of human-induced climate change, it’s something that I’ve grown up being concerned about and I guess I know more about it that your average pop/rock star as I did a degree in Geography, where I studied exactly the problems that yesterday was all about (apparently). I have to say that I have a great deal of respect for what Al Gore is trying to do. His film “An inconvenient truth” is indeed the best way I’ve seen so far at trying to educate the public at large about climate change. But what drove me mad last night, while watching the concert, was the way that celebrities such as the Pussycat Dolls (arrrghghg) repeatedly referred to this problem as a “worthy cause”. It simply isn’t a “worthy cause” it’s a f***ing huge crisis that we all have to deal with. We are not fighting for the safety of a few million people that we don’t know, we are fighting for the survival of our planet – at that involves all of us and our children. "We have here a scales that balances two different things. On one side, we have *gold* bars! Mmmmmm, don't they look good? I'd just like to have some of those gold bars. Mmmmm. On the other side of the scales... um... THE ENTIRE PLANET! Hmmmm... "
"Future generations may well have occasion to ask themselves, "What were our parents thinking? Why didn't they wake up when they had a chance?" We have to hear that question from them, now." I urge everyone reading my blog to watch the film. It’s not an Al Gore promotional campaign, he knows his stuff, he studied it, still studies it and is doing what he can do (which is more than the average person can) to help create a tipping point of support in fighting the causes of human-induced climate change. Anyway, I want to bring this issue back to the theme of my blog and focus in on what climate change means for my new home country, the Netherlands. We all know that Holland is as flat as a pancake (pannenkoek) and that a huge percentage of the country is below sea-level. The Dutch, over their entire history fought a “war with the sea” (that’s actually how they refer to it!). That war is going to getting fiercer and fiercer if generally held scientific views come to fruition. If these predictions do come true then some of the more densely populated areas of the world will be underwater within my lifetime, we are talking about Manhattan, Florida, the delta plains of Bangladesh, Shanghai, and the Netherlands. It is scary stuff and human beings are to blame by pumping out ever increasing levels of greenhouse gases, like carbon dioxide. The CO2 levels in our atmosphere are higher now than in any other point in the Earth’s long history. There are natural cycles of high and low CO2 levels, but we’ve gone way beyond those now. And the scariest thing of all is just how far we are going outside the normal levels. But what does all this extra CO2 mean? Well basically, the more CO2 in our atmosphere the hotter our planet becomes, that’s a fact. CO2 (and other greenhouse gases) basically trap the sun’s energy in the atmosphere. You can rest assured that if we keep increasing the amount of CO2 present in our delicate little atmosphere then it’s going to get a lot hotter. The heat melts the ice on the surface of our planet and the icecaps, and the less icecaps we have reflecting the sun’s energy (like mirrors) the more the sea receives this energy directly and heats up too. It’s a vicious circle which basically results in us having increasingly more water in our world than ice, and a lot more warm water, which leads to devastating events like hurricanes. Now, this may all seem like abstract science (even though it’s all just off the top of my head as I had it drilled into me since I was eleven years old – my geography teachers were great), but I can see the changes happening all around me. I’ve seen and heard over the last four weeks more lightening and thunder storms than I’ve seen over the previous 5 years. They are happening nearly every other day. The Netherlands is a very humid place, but I never expected "tropical storms" like this. Every week our road floods, it looks like a river (or more like a typical Amsterdam canal), and this worries me. What if this river decides not to seep away through the drainage system, but the (already) high water table in Amsterdam rises? There will certainly be more mosquitoes to defend myself against, and I’m already struggling with them (they arrived in March this year). The trees in our street were in bloom with their blossom in January, and both last autumn and winter were the warmest since records began. I’m telling you, it’s obvious to see all around us already. Everyone’s crazy about the weird, wet weather we’ve had over the last month, but is there not something behind this. You could say I’m reading too much into it, you could ignore it, or laugh it off. But what if I’m not wrong? How would you feel in 25 years when your children ask the question I quoted above? Pretty sick I think. The most sensible thing the presenters of Live Earth said last night was to compare climate change to slavery. We now look back at the slave trade of previous centuries with sickness in our stomachs, sadness in our hearts and guilt of being cruel white men in our brains. But how will we feel in 25 years if we look back at ourselves in 2007 with the knowledge that we then could have made a difference, but now all the polar bears are extinct, our icecaps have disappeared and millions and millions of people, including many Dutch people, have been displaced from their homes. Don't leave your mobile phone charger plugged-in to the wall. It uses energy even if your phone isn't attached to it. Feel the plug part of the charger, it's warm, because it's using (wasting) energy. These are just such tiny easy actions, and there’s loads more of them. And they could make a big difference. You could make a big difference. One thing that surprises and disappoints me, almost daily, in Nederland is the huge quantities of raw onion to be found in food. The best example of this is with the Dutch Haring, which is absolutely smothered in raw onions. I can’t understand this. When you eat raw onions, even the smallest snippet, the taste stays in your mouth for at least the next 5 hours, and worse other people can smell it on your breath for much longer. Very anti-social. I don’t mind it so much with things like Haring, because I can easily avoid Haring, but when it comes to the ready-made salad meals, or even bags of salad, to be bought from the Albert Heijn, it’s very annoying. I now check each pack to make sure I’m not paying for a salad that is one quarter raw onions. It’s the same in all restaurants, including the canteen at work. The salad bar has several bowls of different salads to choose from, but many of them contain large quantities of finely sliced onion the pieces of which are very tricky to pick out. The quantity of onion infiltrating the salad bar seems to get more and more towards the end of the work week, possibly because other, less offensive, ingredients are running low. Of course onions are basically the same as Tulip bulbs, which the Dutch have plenty of. I don’t think I’m actually facing tulip bulbs in my salads, but during the “hunger winter” of 1944-1945, the Dutch did eat tulip bulbs as other food was confiscated and sent to Germany. Understandably, the Germans didn’t think the tulips were very tasty and so the Dutch were allowed to keep them. Apparently tulip bulbs are very sweet, they made you sick or give you a rash, so maybe “normal” onions are now a special treat for the Dutch?